The grizzly bear, a member of the brown bear family, can contract various diseases and conditions. Although infectious disease among grizzlies is rare, grizzlies can suffer from parasites, injuries and damage from living in the wilderness. Since bears don't have doctors in the wild, scientists study captive grizzlies as well as those observed in the wild. Parasites plague brown bears. Brown bears can have fleas and ticks, and mange can plague bears. 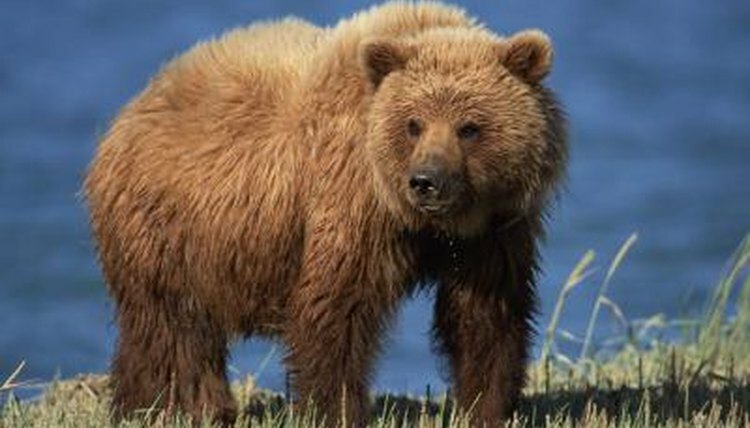 Caused by mange mites, scientists have seen mange in both wild and captive grizzlies. Brown bears can also carry worms such as hookworms and roundworms. They can also carry Toxoplasma gondii, a protozoa, and Trichinella spiralis, a type of roundworm. These parasites cause toxoplasmosis and trichinosis, respectively. Bears can contract canine hepatitis from the canine adenovirus 1 if they are exposed to wolves or coyotes. This disease largely affects captive animals. It can cause anything from a slight fever to death with symptoms including fever, swollen mucus membranes, prolonged bleeding, hemorrhages, swollen and drippy nose and eyes, depression, heart problems and fluid buildup in the head, neck and body. It primarily affects the lungs, liver, kidneys and spleen. Another captive animal virus is the swine herpesvirus 1 which the bear can contract if exposed to pigs. Other diseases, such as rabies, are rare but can be contracted if a rabid animal bites the bear. About 14 percent of a Russian population of brown bears studied in 1999 suffered from broken teeth. Brown bears may damage their canine teeth if fed oats. If the bear makes it into old age, he can suffer arthritis due to his active lifestyle and can furthermore suffer fusion of the spine called spondylosis. If a wild brown bear is captured in a trap, he may suffer from exertional myopathy or capture myopathy. According to a 2003 article in the Journal of Wildlife Diseases, a brown bear suffered capture myopathy when he was captured in a leg hold snare. He died 10 days later. Exertional myopathy is not contagious, but happens when an animal is stressed. The muscles degenerate and flood the bloodstream with creatine kinase and other toxins that can cause the heart to stop.